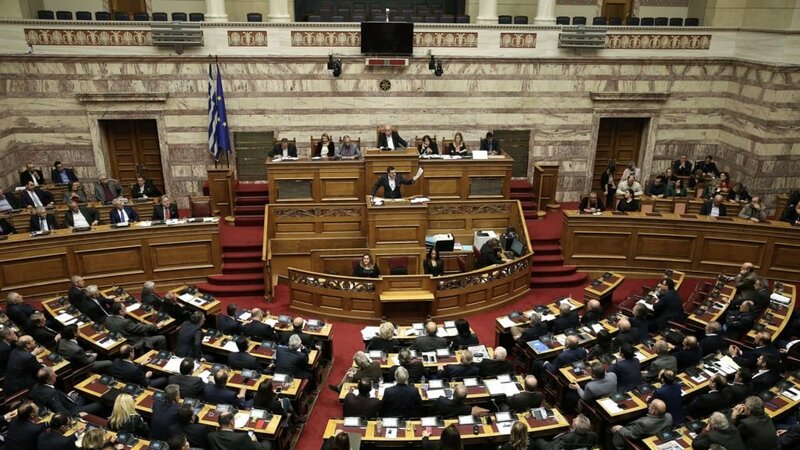 The legislative branch of the Hellenic Republic voted in favour of the Agreement between Greece and the Former Yugoslav Republic of Macedonia tonight, putting an end to the long-standing dispute on the latter’s constitutional name. Under the agreement, Greece’s neighbour will officially adopt the name ‘North Macedonia’. The controversial deal was passed with 153 votes in favor and 146 against. The issue has been the focus of a heated political debate, that has divided Greek public opinion and has caused seismic shifts in the political establishment, causing the breakup of the government coalition between the leftist SYRIZA (Coalition of the Radical Left) and far-right ANEL (Independent Greeks), but also affecting other minor opposition parties. In addition to the 145 SYRIZA MPs, the deal was supported by independent MP and Minister of Tourism, Elena Koundoura (formerly of ANEL), ANEL MP Thanasis Papachristopoulos (who is expected to be expelled from the party following the vote), Deputy Minister of Civil Protection (and former ND minister) Katerina Papakosta, leader of the Democratic Left Party (DIMAR), Thanasis Theocharopoulos (whose decision to back the agreement led to the dismantling of the coalition between DIMAR and PASOK), and three MPs of the centrist party To Potami – leader Stavros Theodorakis, Spyros Likoudis and Yorgos Mavrotas. The small centrist party lost its right to form a parliamentary group this week (a party needs to have at least five MPs to be entitled), after losing another MP to Nea Dimokratia over the Agreement. The Opposition leader also warned that, once ratified, the deal would be legally binding and impossible to scrap or even to modify, calling on MPs to face up to their “historic” responsibility and vote down the deal. Mitsotakis’ predecessors at the ND helm, Antonis Samaras and Kostas Karamanlis, who had both served as PMs, also expressed their opposition to the deal. “The Prespes agreement doesn’t solve problems, it creates many more,” Samaras argued, making a long reference to the history of the region from the Ottoman years to the dismantling of Yugoslavia and warning that any attempt to rewrite history is never innocent. Karamanlis successor at the PM seat, former PASOK leader Giorgos Papandreou has expressed his support for the Deal, while another former PM, Kostas Simitis has been the target of criticism for not taking a stance on the divisive issue. The PM stressed that the Agreement is aligned with what has been Greece’s national policy since 2007 and noted that the deal obliges FYROM to change its constitutional name from ‘Macedonia’ to ‘North Macedonia’, “so that when children search ‘Macedonia’ on the internet, they will see the White Tower, not Skopje.” The PM also said that this change will apply ‘erga omnes’ – that is both in international relations and internal official use and can’t use the name Macedonia in any official manner, from state documents to naming airports and universities. FYROM is also obliged to obliterate any notion of irredentism, acknowledging that the legacy of Ancient Macedonia is part of Greek history. The ratification of the Prespes agreement effectively opens the way for North Macedonia to become a member of NATO and the EU. According to a new poll carried out by Pulse, six in 10 Greeks – or 62 percent of the 1,325 respondents – oppose the Prespes deal, saying that it is “probably bad” or “definitely bad” for Greece. During Thursday’s parliamentary debate, several thousand people had assembled outside the Parliament, chanting “traitors”. When a group of them fired flareguns and tried to get closer to the Parliament on Thursday, the Police pushed them back and used teargas against them, proceeding to 133 arrests and 10 detentions. On Friday, turnout was significanlty lower.